There couldn’t have been a much better occasion than the popular Phra Nakhon Si Ayutthaya world heritage fair to introduce a brand new tourist attraction in Thailand. Honorable Permanent-Secretary for Transport, Mr. Wichien Pojphosri, conducted the unveiling of “Thungbuachom Floating Market”. 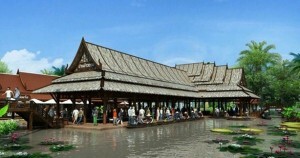 The market offers a wide range of products and recreational activities for tourist. One can scan through the several floating shops selling souvenirs, farm produce and local delicacies or visit the miniature city, waxworks of revered Buddhist monks and auto museum or simply relax and enjoy the spectacular shows offering a glimpse of Thai tradition and culture. The market’s committee chairman was beaming with pride on the opening ceremony and assured with great confidence that the new ‘Thungbuachom floating market’ will bring not only commercial success and a boon to the tourism industry but also be a source of the pride of Ayutthaya. 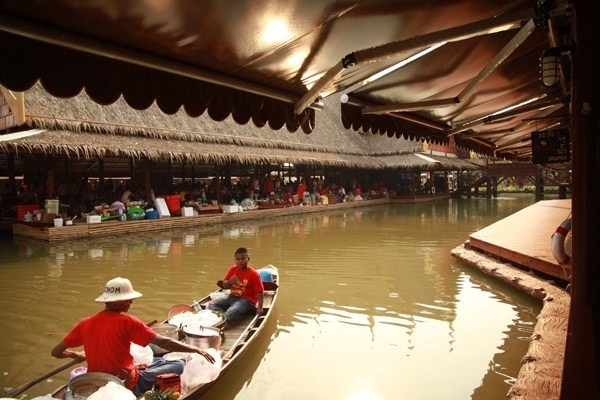 The new floating market is located on a 25-rai piece of land on the outbound side of Phaholyothin Road in Wang Noi district of Ayutthaya province and has approximately coasted a budget of 100 million baht for the buildup. Journy To The Jungle team wishes good luck and hopes the market derives the much anticipated upsurge of tourism and local business. We also congratulate the Ayutthaya province authorities on this advancement.